The new Republican health care legislation in Congress could cost Illinois $40 billion dollars in federal funding over the next decade. That’s according to the recent report by the Congressional Budget Office. Illinois’ health care exchange has not been the success Obamacare proponents were hoping for. Insurance companies have struggled to find customers. But hospitals say the expansion of Medicaid has been huge for Illinois. 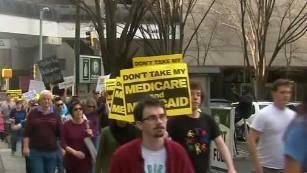 It’s given 600,000 people access to healthcare, so far paid in full by the federal government. Roberta Rakove of the Sinai Health System in Chicago, says the results have been positive. Felicia Norwood, director of the Illinois Department of Healthcare and Family Services, says part of the problem is how little the state gets from Washington to pay for the Medicaid program. Illinois has a large share of its population on Medicaid. But because it’s the fifth-wealthiest state, the feds only cover about half the costs. Governor Bruce Rauner says Illinois wouldn't do very well under congressional Republicans' new health care proposal. Some conservative groups have also criticized the House GOP's new plan to replace the Affordable Care Act.